Washington, D.C. (April 8, 2019) – An Oklahoma technology center was recognized by the President of the United States for performance excellence at an awards ceremony Sunday, just outside the nation’s capital. State Superintendent of Public Instruction Joy Hofmeister attended the ceremony with Lindel Fields, superintendent of Tri County Tech, who accepted the Malcolm Baldrige National Quality Award on behalf of the technology center during a ceremony at the Gaylord National Harbor Convention Center in National Harbor, Maryland. U.S. Commerce Secretary Wilbur Ross spoke at the ceremony to offer congratulations to all recipients of this year’s awards. Also in attendance were Oklahoma First District U.S. Representative Kevin Hern and State Director of Career and Technology Education Dr. Marcie Mack. Tri County Tech is one of 29 public technology centers in the Oklahoma Career and Technical Education System. It serves residents throughout the northeast Oklahoma counties of Washington, Nowata and Osage. The award was established by Congress in 1987 and inaugurated by President Reagan to promote improving the quality of goods and services in U.S. companies and organizations. The award recognizes U.S. organizations in the business, healthcare, education and nonprofit sectors for performance excellence. Up to 18 awards are given annually across six eligibility categories. It is the only formal recognition of the performance excellence of both public and private U.S. organizations given by the president. The program is administered by the Baldrige Performance Excellence Program, which is based within the National Institute of Standards and Technology (NIST), an agency of the U.S. Department of Commerce. *Pictured above: State Supt. 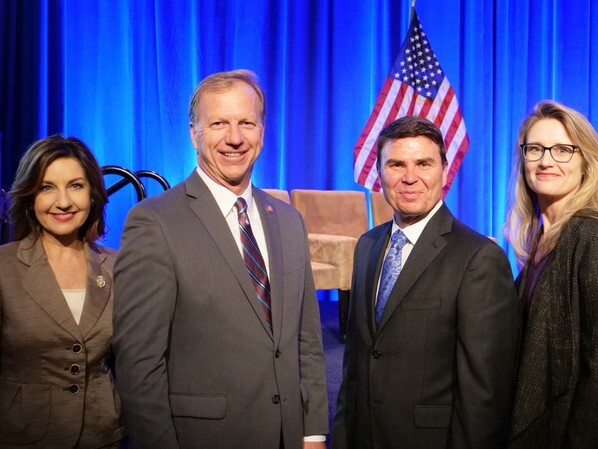 of Public Instruction Joy Hofmeister, U.S. Representative Kevin Hern, Tri County Tech Supt. Lindel Fields, State Director of Career and Technology Education Dr. Marcie Mack.